I mentioned Chill for Day Two’s answer, and am tempted to go back to that for all the same reasons, but I’m not going to do so. Instead, I would have to pick the 5th Edition of Dungeons & Dragons. We’ve got the whole line so far and I’m impressed with the game. When it was winning ENnies a few nights ago, it was the first year I thought it won because it deserved to and not because there were people voting for it, dismissing everything else out of hand, as if they were rooting for their regional sports team because that’s what one does. I hadn’t played D&D proper since AD&D 2nd Edition — third edition (and Pathfinder) seemed like an overwrought mess, fourth edition seemed to stray even further afield yet devolved into an overly-complex miniatures battle game. 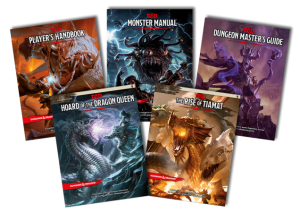 By the time 5e came out, I was done with fantasy roleplaying, but the new edition brought me back to the land of make-believe. And WotC’s campaigns, borrowing heavily from Paizo’s Adventure Path concept, have been…more or less good. The Elemental Evil campaign book could be a complete setting guide for the middle/interior of the Sword Coast. It’s just fantastic. The Starter Set’s adventure is also crazy fun. And we’ve been playing (off and on) as a family. It plays quickly, reminding me of the best of AD&D2ed with some goodness from the past decade of gaming. 4e didn’t feel like D&D to me. 5e does.